(Gulp) No more signed for or special delivery from NCR machines for collectors ! I saw a memo this morning at Acton PO, which said all such labels are to be seen to be attached to a letter or package. Staff would not waiver from that instruction. This is probably due to fact that you have to scan the correct label to get these stamps which puts them into the system. It probably applies to the tracked/signed international services and parcelforce stamps to so it just leaves the standard services, a big loss in revenue for the P O.
I tried to get some SD Open Value stamps from an NCR machine yesterday and the system has changed completely!! 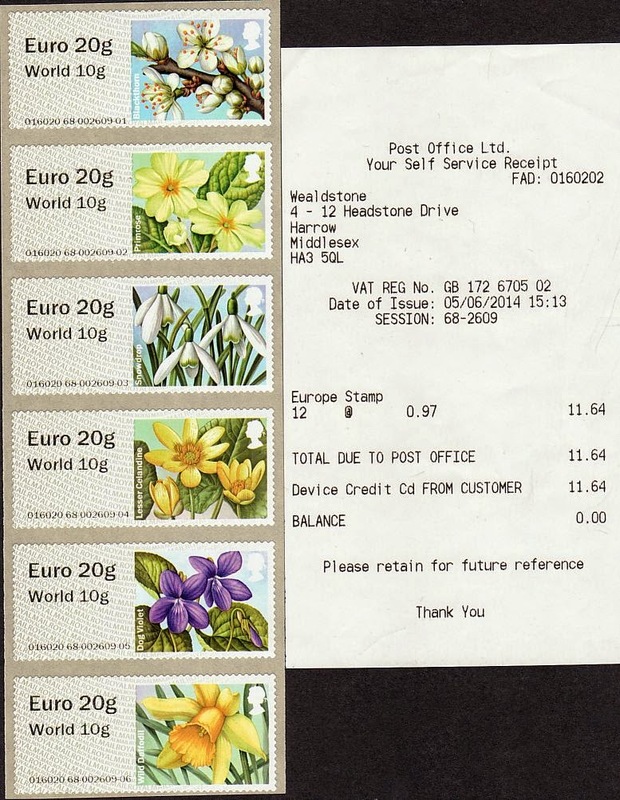 Previously the stamp was paid for first and then the stamp was printed, after that a member of staff was called over to scan their barcode badge and if you wanted the Open value stamp you just took it away with the receipt. From last Thursday the system has changed so that a member of staff is called over before you have paid for the stamp. A barcode from the label you want to use, such as Special Delivery, International Tracked, Parcelforce 48, etc. is scanned into the machine and registered on the system and that label is put on your packet. After that you pay for the stamp and the member of staff sticks the stamp on the same packet!! It means that it is no longer possible to obtain mint Open value stamps for all Parcelforce services, International signed and/or tracked services or Special Delivery priority services! I suppose it reduces the number of mint Open value stamps available for future issues, but as some of the others will now only be available in a used condition, it will make them very difficult to obtain!! I had the same problem at Battersea at the beginning of May. No reason given.